I am always asked, “what should my kids eat for snack?”. I make these muffins and keep them in the freezer for a quick breakfast or go to snack. Buy the mini-chocolate chips as a little bit goes a long way. I’m not normally a fan of hiding healthy things in food but I couldn’t help myself this time. Adding a few crushed walnuts and flax seed meal provides you with healthy fats and Omega 3’s (and they taste DELICIOUS!)! I also find that the flax meal gives the gluten-free flour a little more substance. Enjoy! 4) Spray muffin tins with Coconut Oil (or use paper cups) and bake for approximately 15-20 minutes until golden brown. Ever notice that some of the most picky children like some of the weirdest foods? I always hear stories like, “my kids only eat chicken nuggets, Cheese-Its, and Goldfish…..oh, yeah and pickles! What?! Somewhere in there is a sophisticated eater, just waiting to break free! Keep trying different foods – at least a few times a week. When it doubt, take a new vegetable – wash it peel it and boil it, then put a little olive oil/butter and salt on it and cut it into small pieces. They may just surprise you. Three months ago I didn’t want anything to do with Kale Chips (and neither did my kids). But, I made them several times and now they disappear 5 minutes after they come out of the oven! 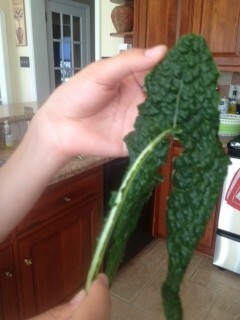 2) Take out stem: Hold piece of Kale upside-down and grab it by the end of the stem. Slide your hand down the stem and the greens should slide right off! 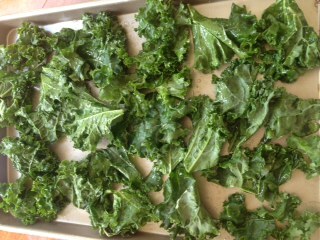 3) Rip Kale into large pieces and lay on 2 baking sheets. Drizzle with a little olive oil and salt. Use hands to toss making sure that each pieces is very lightly coated. Space out pieces on baking sheet – try not to overlap. 4) If you have a Convection Oven, put it on 350 for 7 minutes and they will be perfect! If not put regular oven on 375 for 8-9 minutes. Enjoy! How Can the Kids Help? Teach the kids how to use the salad spinner – faster, faster! Show them how to strip the leafy green off it’s stem. Demonstrate how much a “drizzle” of oil and a “dash” of salt is. 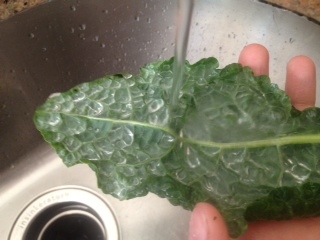 When you flip the Kale leaf over and run cold water over it, it looks like little pieces of glass everywhere! Kale is one of the healthiest vegetables on the planet! Among a host of other vitamins/minerals, it has 180% of vitamin A, 200% of vitamin C, and 1,020% of vitamin K! I was watching the show “Wife Swap” the other day and I had an idea (uh-oh). What if they did a Kid Swap? What if you sent a terrible eater (assuming no food allergies or sensory issues) for 2 weeks to a family that provides only one healthy family dinner? The interesting part of this experiment is that when it is not your child, the anxiety and emotion is removed. It’s a heck of a lot easier to say to a child that is not your own, “oh well, too bad you don’t like dinner, maybe you’ll eat breakfast”. Assuming the dinners were simply prepared, fresh foods, do you think the child would starve? It would be like a food boot camp. Only instead of 100 push-ups, the child would be given fresh roasted chicken and vegetables with rice. Who’s interested? I live at 234 Main Street……potty trained please. This is a traditional Italian dish but I simplified the recipe and the flavors to accommodate families of all ages. It’s a great side dish or spoon this over brown rice for a hearty meal. This is so great in the winter and re-heats perfectly the next day for lunch. Cook ½ onion and 2 garlic cloves in about 3-4 TBS of olive oil in a heavy pot. Cook until soft about 6-7 minutes. Add 1 peeled/diced eggplant and 3 peeled/diced zucchini and 1 bell pepper (any color). Cut up and add 4-5 tomatoes (these will break down when cooked – could also use 1 can of diced tomatoes). Add 2 TSP salt and 1 TSP pepper and some basil (fresh, 1 TSP of powdered or 1 TBS from a tube). Optional: Add a Tablespoon of apple cider vinegar for additional depth of flavor. Cook until soft at least 10-15 minutes. Add some water or broth if it gets too dry – should look like veggie chili. Note: This dinner warms your soul and is a perfect meal for your toddler! You can also add celery, carrot and/or mushrooms to this recipe. What Can the Kids Do? Use a chopper to chop up the onion. Learn how to use a peeler (if ready) and help peel the zucchini (soft skin). Set the table and get the drinks. Many Caponata recipes are made with olives, celery and capers and traditionally have more of a sweet and sour taste. Some versions of the recipe include octopus or swordfish. This granola is so addicting and so much cheaper to make than to buy. Play around with the recipe to make it your own! 2. Stir in 4 cups of oats (not quick-cooking) into the bowl. 3. Line a baking sheet with parchment paper and spread out granola evenly on the pan. Should be a little sticky. Bake on 350 for 15 minutes. Use convection if you have it on 325. Spread back on baking sheet and bake on 350 for another 15 minutes. Take out of oven if getting too brown. Let it cool in the pan. Store in Ziploc bags leaving large chunks. Note: Are your kids not a fan of big nuts but want the protein and health fat? Crush walnuts or almonds into tiny pieces or powder. Tis the season….of arguing already?! My kids have been out of school only 2 days and it has started already. 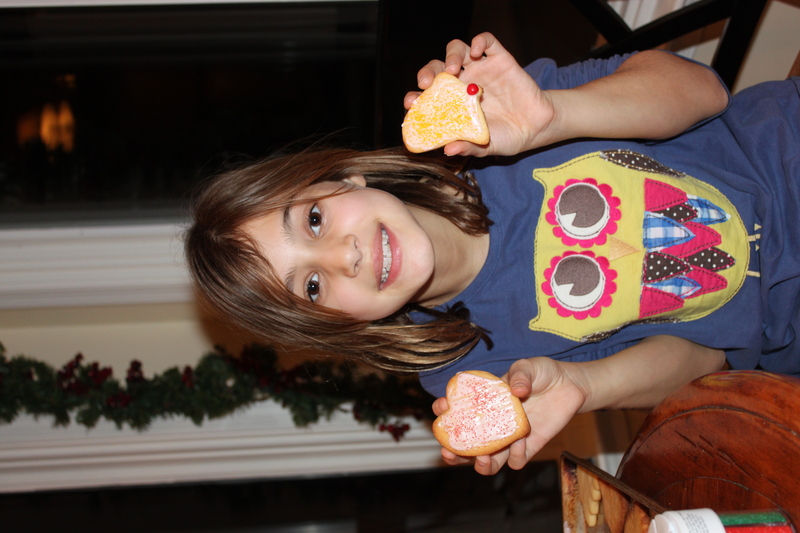 The ONLY thing that transforms them into a Charles Dickens novel almost immediately is decorating cookies. They are so cute painting on the icing and carefully designing the colored sprinkles, working and laughing together….who are these children? Forget the 7 fishes dinner tonight, let’s make more cookies! If you only make one more batch of cookies besides sugar, make these Rocky Mountain Cookies. I revised Laura Bush’s Cowboy Cookies and my daughter re-named them, Rocky Mountain. They are not the healthiest but your guests will love them! Mix flour, baking powder, baking soda, cinnamon and salt in bowl. Beat butter on medium speed until smooth and creamy, 1 minute. Gradually beat in sugars to combine, 2 minutes. Add eggs, one at a time, beating after each. Stir in flour mixture until just combined. Add chocolate/white chips, oats, coconut and cherries. Bake for 17 to 19 minutes, until edges are lightly browned; rotate sheets halfway through. Remove cookies from rack to cool. These cookies will be brown, don’t worry they are not over-cooked. The coconut will make them chewy. If you put the coconut through the food processor quickly, you won’t even know it’s in there. I love Thanksgiving because nobody serves kid food at this meal. There is simply no time or room in the oven for chicken nuggets. The kids actually eat the simply prepared foods such as the turkey, corn and sweet potatoes. You can have one meal for everyone (at least one day of the year)!!! 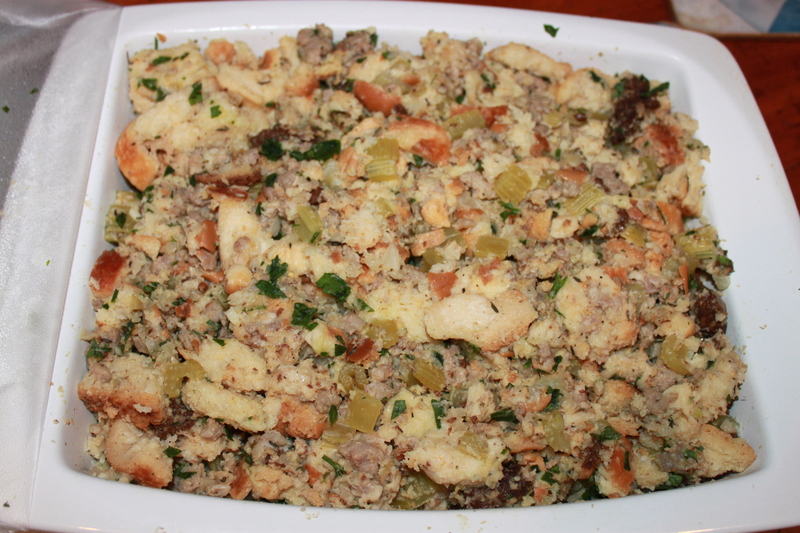 Two of my favorite Thanksgiving recipes are 1) Sausage Stuffing and 2) Cranberry-Pear Relish. I have wonderful memories of my mom teaching me how to clean and prepare the turkey and make the stuffing. Now, I enjoy cooking and teaching my younger cousin how to prepare these special dishes. Thanksgiving is not just about the food but the traditions and memories associated with the meal. What Thanksgiving traditions will your children cherish? 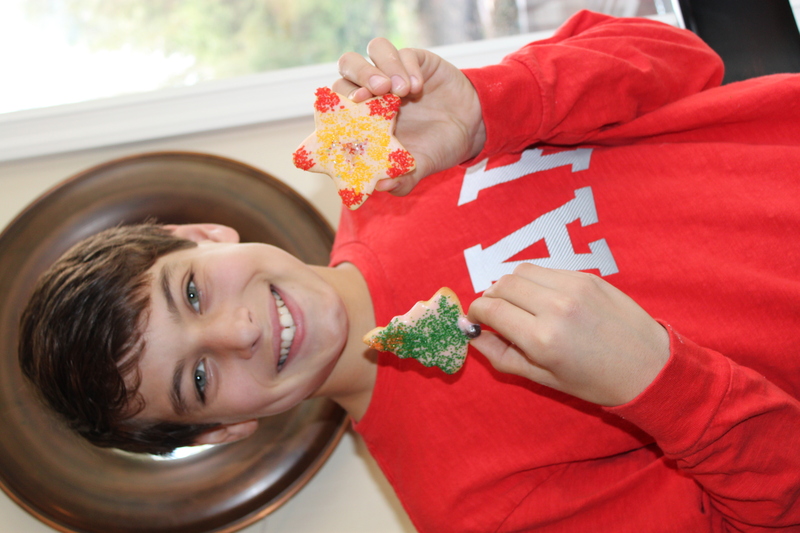 I hope you enjoy these recipes and that you and your family have a wonderful Thanksgiving! I always make a double batch for 12-15 people. 1) Take 1/2 lb of Organic Italian turkey sausage out of casing and fry in a large pot, chopping into small bits until cooked through. Move sausage to plate and set aside. 4. Gradually add about 2 cups of chicken broth and stir until moistened adding more broth as needed. Should be moistened but not soaking wet. 5. Place in sprayed baking dish. You can refrigerate for 1-2 days. Heat on 350 for 30 minutes (add about 1/4 cup of chicken broth before heating if looks dry). 1) Bring 1 ½ cups of sugar and ½ cup of water to a boil for 5 minutes. 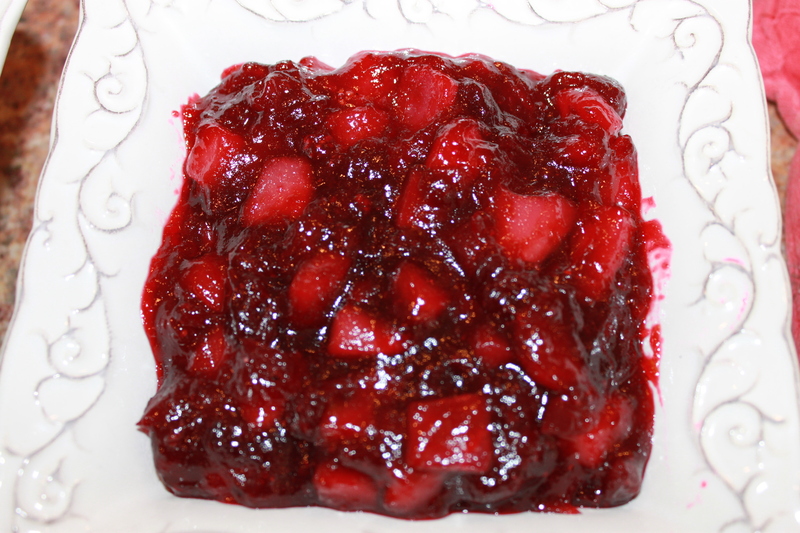 3) Stir and continue cooking until thick like jam (about 15 minutes). If sauce starts to stick to the pan, reduce heat to Medium. Press and “pop” all the cranberries. Cook until smooth and much of the water is absorbed. 4) Cover and refrigerate for a few hours or days. This will thicken in the fridge. Don’t forget to prepare a timeline of tasks to be done to ensure that everything is HOT and ready to serve at the same time – the biggest challenge! I admit that I feel a sense of accomplishment and true happiness when someone eats (and likes) something I have cooked. I like making others feel full and content if only for a brief moment – almost like a really good hug. You will love this recipe for Pumpkin-Apple Muffins. I suggest you wrap-up a few and ask your children to deliver them to a neighbor, friend or teacher. I guarantee it will make them feel happy – and the recipient will enjoy them too! 1. Combine Flour(s), Cinnamon, Baking Soda and Salt in a large bowl. 2. Beat Sugar, Pumpkin, Eggs, Oil and Apple Juice until fully blended. 3. Add to flour mixture and stir until blended. 4. Pour into muffin trays and bake in 350 degree oven for approximately 30 minutes until golden and toothpick comes out clean. Add 20-30 mins. for loaf pan depending on size. How the Kids Can Help? Baking is the easiest way to teach kids how to measure and stir. Ask the younger helpers to put the muffin papers in the pan. The kids can do the toothpick test for you too! Did you know that a pumpkin is really a Squash. The largest pumpkin was close to 1500 pounds!